One Piece Construction So Cover Stays In Place. Heavy Corded Elastic All Around The Edge To Ensure A Snug Fit. Designed For Moderate Usage w/ A One Piece Heavy Duty Cotton Cover And A Generous 8Mm Pad. 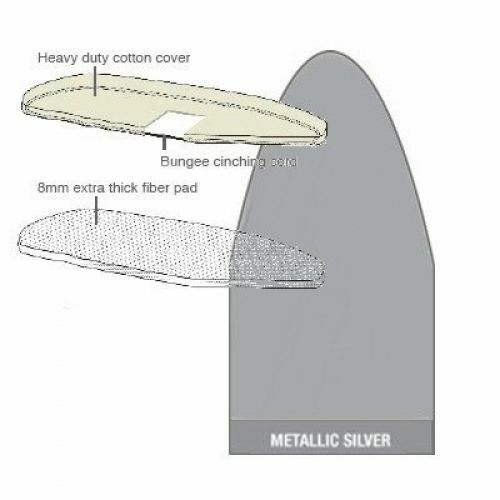 IBC-9454-69RM Color: Metallic Silver Features: -Fits boards sized 54'' x 15''-17''.-Heavy duty cotton cover.-Bungee cinching cord for a tight fit.-Thick fiber pad.-Scorch resistant. Construction: -One-piece construction for easy placement. Color/Finish: -Choose from Natural, Metallic Silver, and Beach Stripe colors. Dimensions: -Overall Dimensions: 54'' W x 17'' D.